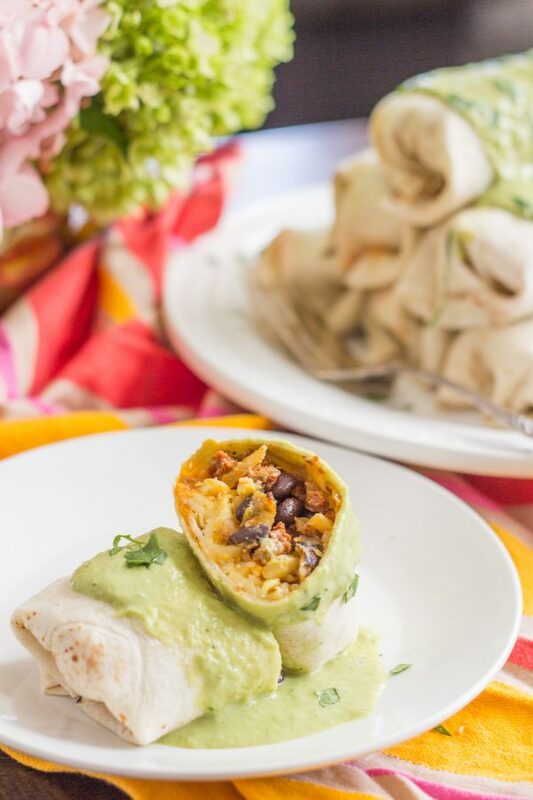 To quote my husband, “I give this meal an A+ and I am not just saying that to be nice.” I have created the very best breakfast burritos and they are the ultimate weekend breakfast. 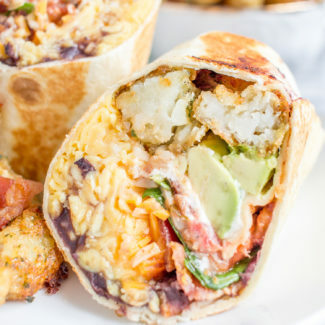 These are the best breakfast burritos that I have ever had, and I love breakfast burritos. I added all of my favorite breakfast foods: crumbled chorizo with sautéed onions, hash browns, black beans, scrambled eggs, and cheese. Then I poured homemade poblano cream sauce on top and added a sprinkle of chopped cilantro. What more could you want on a Saturday morning? Look, I love going out to brunch, but when it’s freezing cold in Chicago I would much rather cook brunch at home in the comfort and warmth of my pajamas. Recently I have upped my weekend brunch game by planning it out on Friday and buying all of the ingredients so everything that I need is waiting for me on Saturday morning. It leads to a much better final result than just throwing together whatever I find in the kitchen and cupboards. 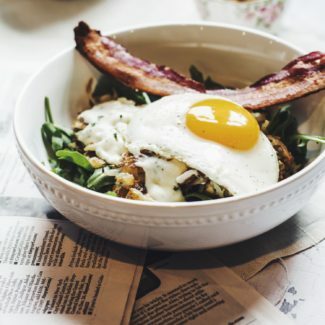 This breakfast recipe is more involved than most of my recipes, but you can scale it to make lots of food. 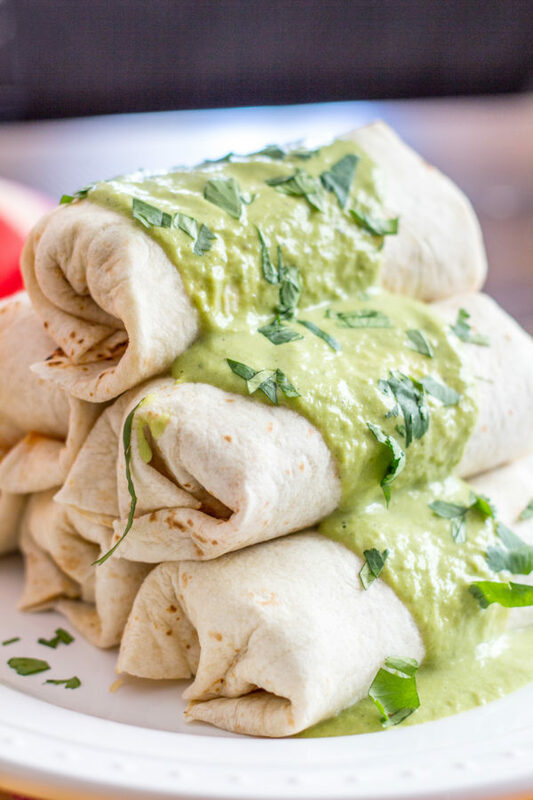 This recipe makes 6 breakfast burritos but you could double it to stock your fridge with breakfast for the week. To save time on Saturday morning I prepared the chorizo and the poblano creams sauce the night before. 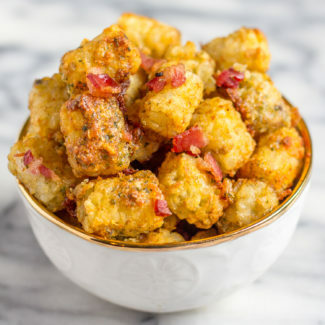 Another timesaver is to use store-bought hash browns. Simply Potatoes and Ore Ida make them, and you can buy them plain or with different seasonings. I used Southwest hash browns for this meal. 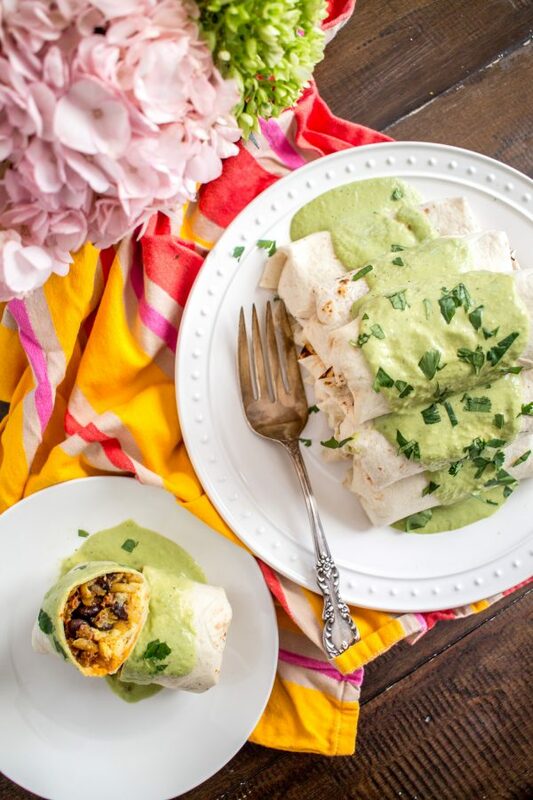 To make these burritos extra special, I added my poblano cream sauce on top. The sauce was inspired by a meal that I had at Port Fonda in Kansas City last year, and it is the perfect combination of creamy with smokey spicy heat. I can eat it by the spoonful. Trust me, make a jar of the sauce and you will find so many ways to serve it. Mix it in with some shredded chicken and make tacos, add it to scrambled eggs, and definitely pour it over these breakfast burritos. I used large tortillas to make these burritos, but if you are feeling extra hungry you can use extra large tortillas instead. To quote my husband, "I give this meal an A+ and I am not just saying that to be nice." I have created the very best breakfast burritos and they are the ultimate weekend breakfast. These are the best breakfast burritos that I have ever had, and I love breakfast burritos. I added all of my favorite breakfast foods: crumbled chorizo with sautéed onions, hash browns, black beans, scrambled eggs, and cheese. Then I poured homemade poblano cream sauce on top and added a sprinkle of chopped cilantro. What more could you want on a Saturday morning? 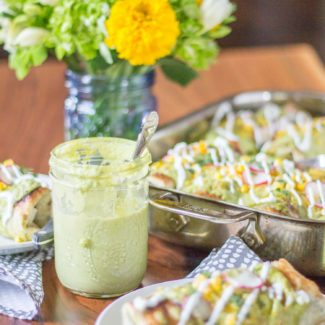 First you want to make a batch of the Poblano Cream Sauce. Next, heat the olive oil in a skillet over medium heat. Add the onion and sauté until it is translucent. Then add the chorizo and use a wooden spoon to break it into small pieces. Cook until the chorizo has browned. Set aside. Move on to preparing the hash browns. Melt the butter over medium high heat. Add the hash browns, season with salt and pepper. Throw some hot sauce in there if you like. Stir frequently and keep an eye on them while you work on the scrambled eggs. You want the hash browns to lightly brown. Whisk the eggs together. Lightly grease a skillet with butter or olive oil, and heat over medium low heat. Add the eggs, and stir frequently. Once they begin to solidify, season with salt and pepper. I like to cook scrambled eggs low and slow, they are so much better that way. While the eggs are cooking, heat up the beans. See, I wasn't lying when I said this recipe takes some work. There are a lot of different things to cook and heat up. To assemble the burritos, first heat up the tortillas. You can throw them all in the oven, or you can place them directly over a gas burner for about 5 seconds per side. Take a warm tortilla, and add about 2 tablespoons of chorizo, hash browns, beans, egg, and cheese. I think adding the cheese last helps to hold the burritos together. Then fold over the sides of the tortilla and roll it up. Continue until you use up all of your ingredients. You could be able to make 6 large burritos and about 4 extra large burritos. 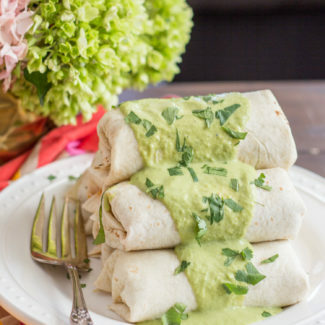 Serve the burritos topped with warm poblano cream sauce and maybe some cilantro. This breakfast recipe is more involved than most of my recipes, but you can scale it to make lots of food. 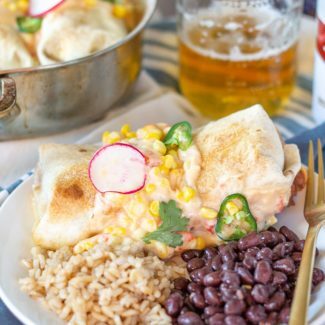 This recipe makes 6 breakfast burritos but you could double it to stock your fridge with breakfast for the week. To save time on Saturday morning I prepared the chorizo and the poblano creams sauce the night before. Another timesaver is to use store-bought hash browns. Simply Potatoes and Ore Ida make them, and you can buy them plain or with different seasonings. I used Southwest hash browns for this meal. 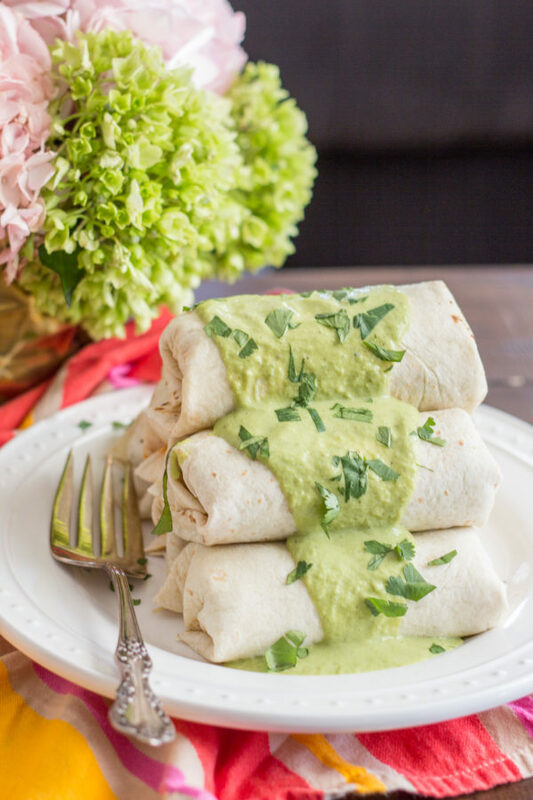 To make these burritos extra special, I added my poblano cream sauce on top. 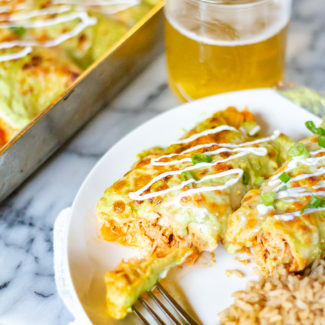 The sauce was inspired by a meal that I had at Port Fonda in Kansas City last year, and it is the perfect combination of creamy with smokey spicy heat. I can eat it by the spoonful. Trust me, make a jar of the sauce and you will find so many ways to serve it. Mix it in with some shredded chicken and make tacos, add it to scrambled eggs, and definitely pour it over these breakfast burritos. I used large tortillas to make these burritos, but if you are feeling extra hungry you can use extra large tortillas instead.